Can you make yogurt at room temperature? That would be much easier than the usual method. * Yes, you can make room temperature yogurt! 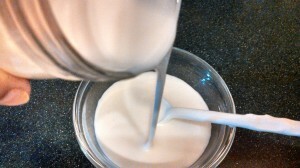 Making room temperature yogurt is easy and is also a great way to keep your raw milk raw when you make it into yogurt. This method works just as well with pasteurized milk, however, so you can make yogurt at room temperature, which is very easy, no matter what milk you use. This works with any kind of milk you have (i.e. cow, goat, other…). *The usual method involves heating the milk first, letting it cool before adding the culture, and maintaining it at that temperature until cultured. First, you need to obtain a yogurt culture that does its culturing at room temperature. These are sometimes called mesophilic cultures. This method can be used with villi culture and with Danesco’s feta culture**. There may be others. The one I have used is the Viili culture. Viili is a fermented milk yogurt from Finland. It is thick and viscous, almost jelly-like, in texture. It is mildly sweet and pleasant tasting. You can order either a fresh or dried Viili yogurt culture from WellsofHealth on Etsy. Cultures for Health also sells a dry culture. My friend, Aaron, gave me some of his Viili culture, in the form of Viili yogurt, but you can also purchase a Viili culture. Use the fresh starter as I describe here. You would reactivate the purchased dry Viili culture, which comes as a dry powder or granules, and culture it in sterile milk to make the starter. Sterile milk is milk that has been heated to 160 degrees. 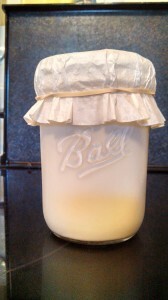 Be sure to cool your sterile milk to room temperature before adding your starter. Cover with a coffee filter while it cultures. I made my starter by adding 1 tablespoon of the Viili yogurt from my friend to 1 cup of sterile milk, which was cooled to room temperature. (You can also use sterile milk or purchased pasteurized milk, straight from the refrigerator, to make your starter or to use in making your yogurt.) I stirred the yogurt into the sterile milk, covered it with a breathable cover (such as a coffee filter secured with a rubber band), and let it sit on the counter until it thickened. This took about 22 hours for mine. **With the Danesco Feta Culture, you add the culture each time you make the yogurt and do not keep a starter batch going. Add 1/16 tsp. powdered starter per quart of milk and leave to culture at room temperature until thick (12-24 hours). I did not have great luck in making yogurt with this culture. It was thin and tasted like buttermilk. This tasted great, but was not what I was going for. After the yogurt is thickened, put a regular lid on it and place in into the refrigerator. This stops the culturing process. After it is chilled, enjoy it as you would any yogurt. Add fruit to it, eat it plain, add it to a smoothie, or any recipe calling for yogurt. Just remember that if you heat it above about 100 degrees, you will kill the beneficial probiotic organisms. 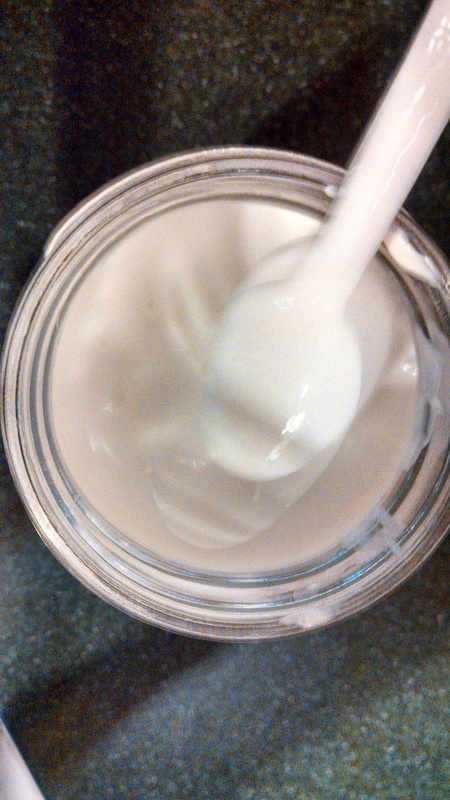 If you made this with raw milk, your yogurt also contains the beneficial organisms naturally present in the raw milk. 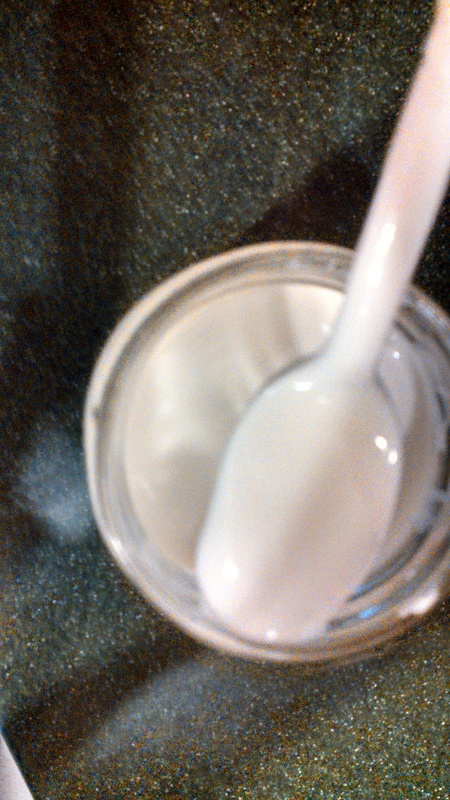 In addition to being thinner than traditional yogurts, my Viili yogurt seems to have a very gelatinous type of texture. It slides off of the spoon in globs. Just be warned that the texture is quite different from what you are used to. It still tastes great, is healthy, and, best of all, is far easier and quicker to make than traditional yogurt. This yogurt will keep for one to two weeks in the refrigerator. You should probably make new starter with sterile milk about every week to keep the organisms healthy. I am glad you found the article helpful. Thank you.